Dungeons & Dragons is a piece of cake so long as the Dragon you’re slaying is made out of cake then an ordinary kitchen knife will do the job! 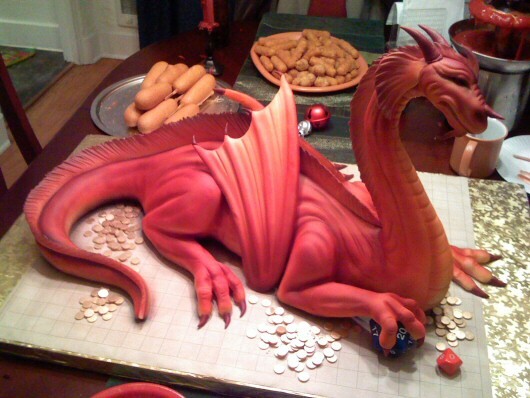 But, seriously, when Mike’s Amazing Cakes created this Birthday Cake of a Red Dragon clutching a D20 they created a work of art. And that’s a battle map it’s sitting on, by Jove! Y’know I think if someone brought this to one of our gaming sessions we’d have to do a special dungeon-run versus an Ancient Red. There you go guys, if you’re getting fed up* with the current campaign and fancy a big challenge to gain heaps of XP and go up that next level – you know what to do! You can find more pictures of this beautiful monstrosity on FLICKR including it’s death and devourment. 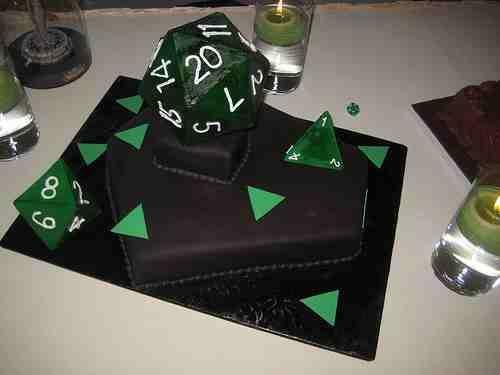 But this is not the only D&D themed cake made for, and in some cases by, rabid fans. Oh dear me, no. You might even say the best is yet to come! 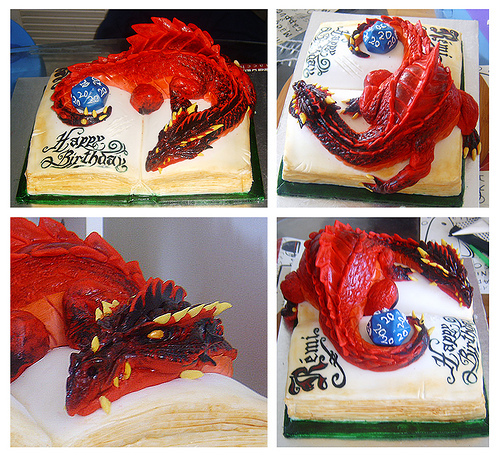 This fabulous cake of (judging by scale) either a baby Dragon or a Pseudodragon was made by Claudia Robinson of Cakerific. 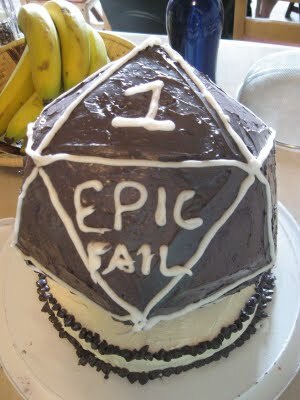 It is Chocolate underneath the icing and the D20 is edible. Good job too because you couldn’t use it for gaming – there are 20s on every side! I call shenanigans! And speaking of edible D20s check out this Wedding Cake by Maples Wedding Cakes adorned with polyhedral dice. These have proper numbers on them and everything. It’s Chocolate flavoured and, if the regular-sized D20 on the table is anything to go by, enormous! But were would any D&D game be without the almighty DM? 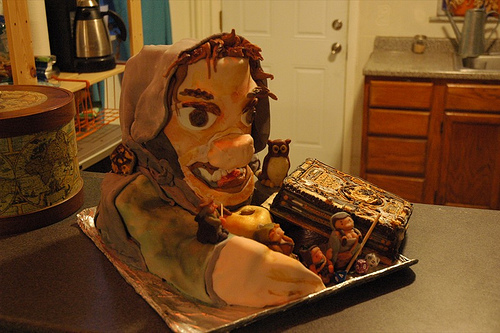 This Dungeon Master Effigy Cake may look a little scary but the Devil is in the details, believe me. There are little marzipan characters repressenting the players from their campaign complete with equipment and Owl Familiar. 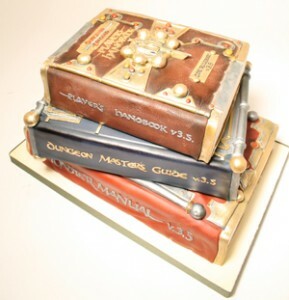 There’s even an Apple of Discord and the Dungeon Master’s Guide is simply the best and most detailed I have seen in cake form! 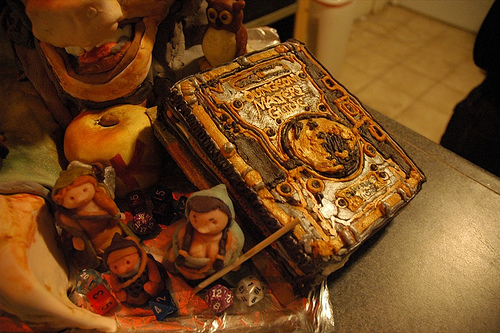 Apart from this incredibly realistic one of a big pile of D&D books by Charm City Cakes (left) or this one (right) by snarkychef based on the Players Handbook 3.5. She has also made one of the Dungeon Masters Guide and is planning to attempt the Monster Manuel. You might need a Dungeon to go with your dragon so here’s one made of scrumptious chocolatey goodness (click to zoom). Another wedding cake – that’s one in the eye for people who think Geeks can’t get girlfriends! Apparently this one is based off an actual D&D campaign. It has minitures on top -and why not? Normal wedding cakes use minitures of the Bride and Groom don’t they? This is far more exciting! 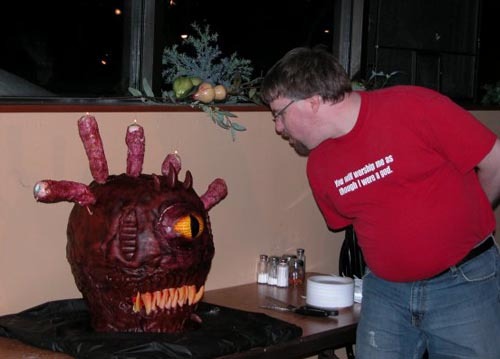 A Beholder Cake created by Mad City Cakes. The eyestalks hold little eyeball candles – ingenius! The Beholder is possibly Dungeons & Dragons most iconic monster, the question is are you going to eat it or is it going to eat YOU? Wow-whee! Made by Rosebud Cakes for a Bar Mitzvah not everything is edible but it’s an epic job nonetheless. 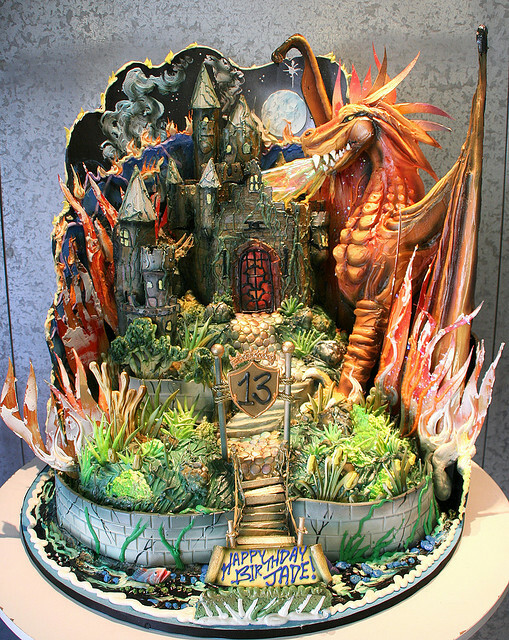 I think the fire and the backdrop are made out of cardboard but the rest – the dragon, the castle, and the land with all those fiddly little details like the grass and the cobblestones – look like yummy cake to me. Wow. I think my eyes, tastebuds and tummy would remember something like that forever and ever. 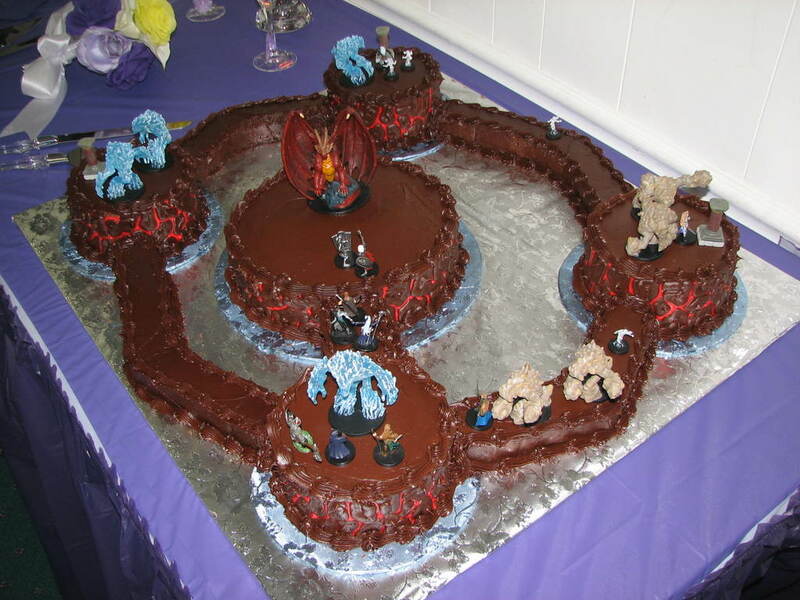 Of course other cakes have been made based on D&D but I think I have shown you the best. Meanwhile I’ve found a cake that suits me to a tee. It’s chocolate, made by C&C Cakery and would you believe it’s EPIC FAIL?